The weather may still be hovering near the 80s, but the air is beginning to feel crisp around the edges. Fall is coming, which means boots, and soups, and after school sports. I’ve been working more when the kids are in school, and the lazy days of summer are gone. We have homework this year. 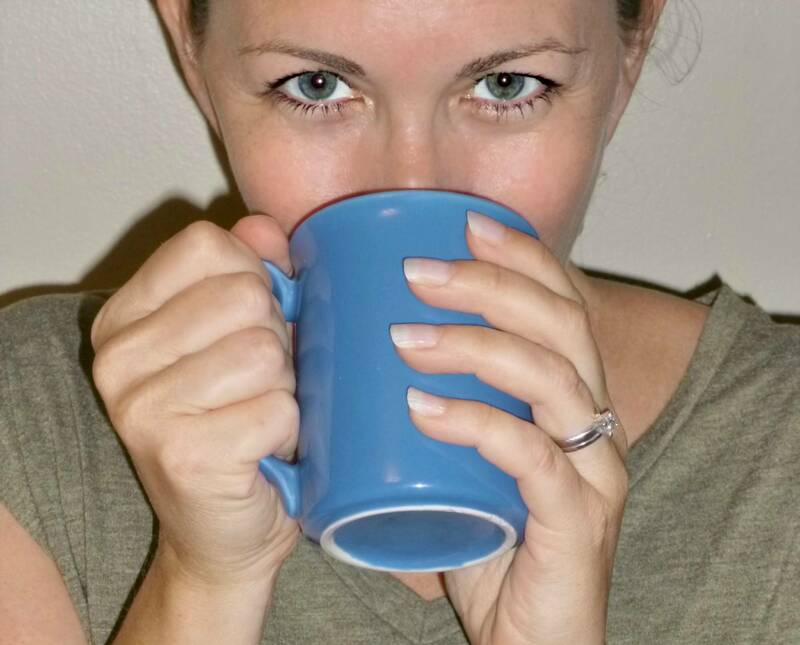 I’m busier than I expected to be, and I’m falling in love with my Crock Pot all over again. I’m all about easy recipes that I can throw together in between making lunches and getting ready for work, and today’s recipe honestly could not be easier. It’s one ingredient. It’s two steps. When I was cruising the internet looking for some guidance on Crock Pot baked potatoes, there seemed to be two basic methods of cooking. One method is to wrap the taters in foil, and the other is to wash the spuds and just toss them in the slow cooker. I chose the Crock Pot Baked Potatoes without foil, mostly to save time and the few pennies in foil. I didn’t even poke holes in the potatoes. Seriously, easiest recipe ever. My kids are 63%* more likely to eat anything if they help prepare it, and they loved “decorating” their own potatoes. Surprisingly, they were pretty reasonable when it came to their toppings, which meant there were still bacon bits and sour cream left when the kids were all done. I served the potatoes with last night’s leftover Mississippi Roast, for a classic meat and potatoes type dinner. My husband, who was starving when he got home from work at 8 pm, was pleased. * I made up that number. Are you surprised? 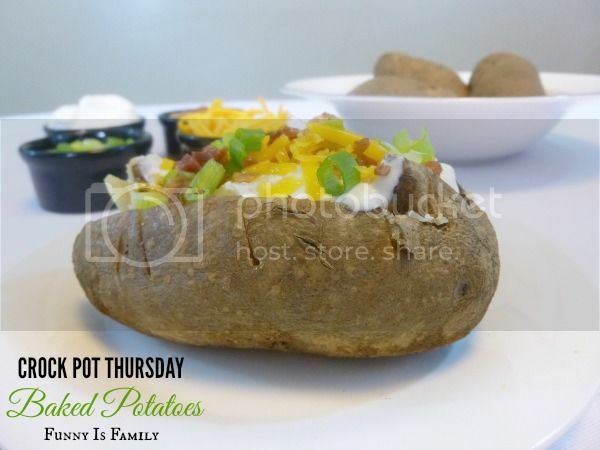 I used my 6.5-Quart Crock-Pot Programmable Touchscreen Slow Cooker to make these Crockpot Baked Potatoes. Serve with various toppings, potato bar style. 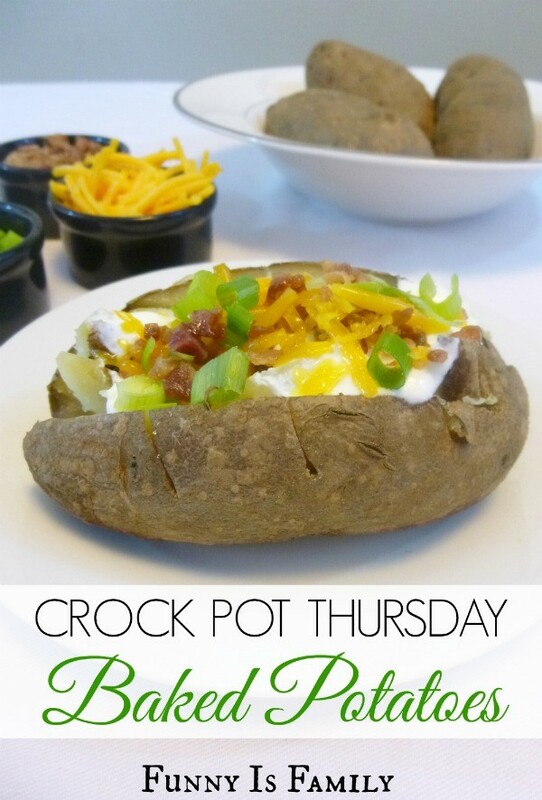 What a perfect way to make a lot of baked potatoes! No mess no fuss just easy and perfect!!! These were tasty and the skin of the potato was neither too soft or too hard. I cooked on low for 5 hours. My potatoes were on the smaller side. Loved this idea. I cooked 7 big potatoes, for 8 hours. They were done perfectly. We had them the first night covered with chili, cheese, sour cream, and onions. The rest were made into potato salad. They were great for that also. I will do this again and again, I am sure!! My potatoes were huge, so I cooked mine on low for 8 hours. They probably could have used another 30 minutes or so. This is how I'll be cooking my potatoes for potato salad from now on, and I'll be trying this method with sweet potatoes very soon. Winner, winner, spuds for dinner! This recipe was shared on Whatcha’ Crockin’ Wednesday. Follow FunnyIsFamily’s board Crockpot Recipes on Pinterest. I thought this was the best idea ever, so i gave it a try. I cooked two potatoes on low from 7am until 5pm (that’s 10 hours folks), and they were still hard!! I couldn’t believe that, and put them into the microwave for several minutes to finish up cooking. I don’t think I’ll try this technique again……to bad, I still love the idea of it. I do enjoy reading your Thursday recipes, keep up the family fun. Oh, no! I wonder if it works better with a fuller slow cooker? I only used 4 spuds and they were good, but the rest of the group used more than that. I’m sorry they didn’t work out, but I so appreciate your taking the time to share your feedback! Do you need to pierce the potatoes before placing in the crock pot? Your recipes are great. I was skeptical that this would work, but it did. The potatoes were cooked just like I wanted them to be. I loved how the skins didn’t get too hard but rather were soft and still tasted delicious. Thanks, Lollie! We love them for a quick and easy dinner! Do you have to put water in the bottom?